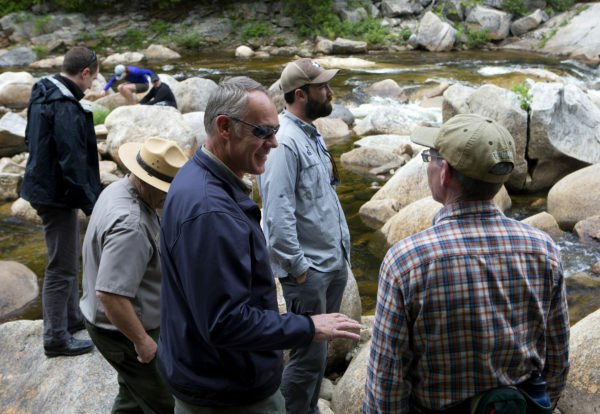 U.S. Secretary of the Interior Ryan Zinke (left) chats with outdoor enthusiasts during a tour of the Katahdin Woods and Waters National Monument Tuesday. TOWNSHIP 2, RANGE 8 ― Secretary of the Interior Ryan Zinke said Thursday that he might recommend that Maine’s Katahdin Woods and Waters National Monument be upgraded to a national park. “The executive [branch of the federal government] does not have the authority” to create a national park, “so the driver would have to be from Congress,” Zinke said at a breakfast with Katahdin area political and business leaders at River Driver’s Restaurant & Pub. Yet Zinke did not discuss the possibility of turning the monument into a national park when he met later Thursday in Augusta with the Maine Forest Products Council. To Roberta Scruggs, the council’s communications director, that meant Zinke was not seriously considering that option. Zinke is visiting Maine as part of the Trump administration’s review of 27 of the national monuments that Presidents Bill Clinton and Barack Obama created by executive orders, citing powers granted by the Antiquities Act. President Trump has asked Zinke to report back to him on what should be done with those monuments. It is unclear whether presidents have the power to abolish national monuments; Congress does have that power. 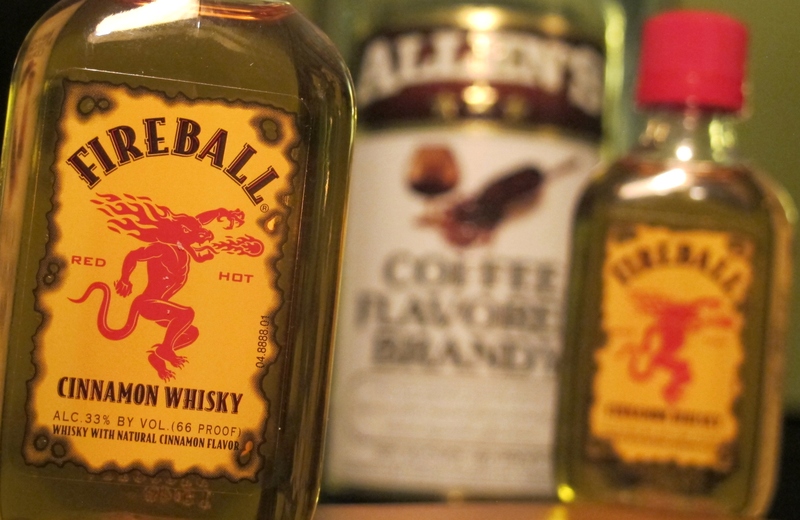 The Secretary of the Interior is expected to submit his recommendations in mid-August. If Zinke urges Trump to ask Congress to make Katahdin into a national park, that would surely reignite the debate that has split environmentalists and northern Maine forest products industry stalwarts for more than 20 years. The most recent campaign to make the area a park died in 2015 when it became clear to Lucas St. Clair that no one in Maine’s congressional delegation would introduce such legislation. Last August, St. Clair’s family, which includes Burt’s Bees entrepreneur Roxanne Quimby, St. Clair’s mother, gave the federal government the 87,562 acres that were immediately designated Katahdin Woods and Waters National Monument. A former Republican congressman from Montana, Zinke said he is friends with U.S. Rep. Bruce Poliquin, R-Maine, and has discussed with him the possibility of making the monument a national park. Meanwhile, St. Clair said Thursday that he is delighted with the idea of resurrecting the park campaign. He dismissed the idea of having a state agency own or manage the monument. Presidents can create monuments through the Antiquities Act, but only Congress can create parks. Maine’s Acadia National Park began as Sieur de Monts National Monument in 1916 when it was created by President Woodrow Wilson. It became Lafayette National Park three years later. In 1929, it acquired its current name. The Katahdin monument’s foes are particularly upset that it is under federal control. Poliquin and Gov. Paul LePage have pressed Zinke to transfer control to the state, a theme council members returned to on Thursday. Zinke again signaled resistance to that idea. That likely won’t please LePage, whose influence, some critics contend, got Katahdin Woods’ status reviewed despite its being smaller than the other 26 on Trump’s list. Zinke took questions from media after the breakfast but canceled a news conference planned for after his meeting in Augusta with the council, which represents forest products manufacturers and landowners. Zinke did reiterate on Thursday his opening to logging in the monument and got St. Clair’s support for the idea. That is significant because, according to forestry industry representatives, the Quimby family has resisted allowing logging there. Quimby had banned logging and hunting after buying the land. During his meeting with the forest products council, Zinke stressed the Trump administration’s commitment to sustained employment and to good relations with local industries, Maine Forest Service Director Doug Denico said. Zinke also reiterated that final decisions would lie with the president and Congress.